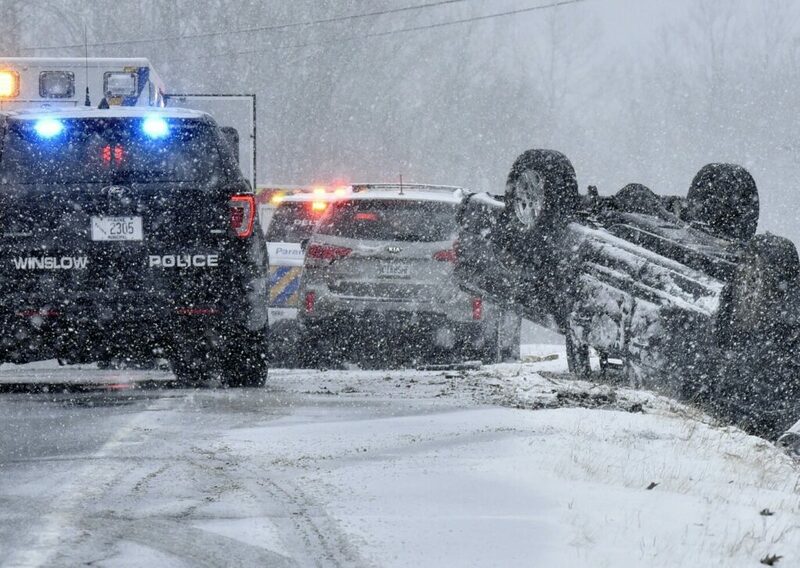 Slick roads contributed to a number of crashes Monday afternoon, authorities said, and the messy weather was expected to continue through Tuesday. 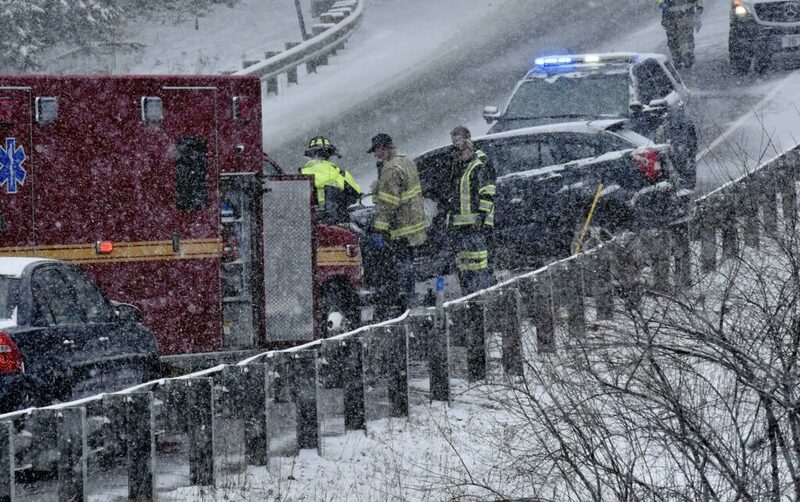 Slick roads from a spring snowstorm contributed to crashes throughout central Maine on Monday as wet, snowy weather made its way through the area. Up to 3 to 4 inches of accumulation fell in most parts of the region, and southern Maine saw sleet mixed with snow, according to meteorologist Derek Schroeter of the National Weather Service in Gray. Several crashes were reported throughout central Maine, including a single-vehicle rollover in Winslow and a report of a car hitting slush and crashing into a telephone pole in Madison. “It is spring, but it’s also Maine and winter can hit any day,” said Officer John Veilleux of the Winslow Police Department. Just before 1 p.m. Monday, a pick-up truck rolled over in the 1200 block of China Road in Winslow, Veilleux said. He said the crash, which involved a 16-year-old driver, was caused by a combination of messy road conditions and driver inexperience. The driver, whose name was not released because she is a juvenile, was also charged with driving without a license and was treated at the scene for minor injuries, Veilleux said. The Route 137 corridor between Winslow and China proved problematic throughout the afternoon, as more reports came in of vehicles sliding off the road or getting stuck on hills. In Madison, Chief Deputy James Ross of the Somerset County Sheriff’s Office said a crash on White School House Road in which a car slid on slush and hit a telephone pole, snapping it, was not bad. The driver was transported to a local hospital as a precautionary measure, Ross said. In Waterville, two vehicles collided head-on on West River Road around 1 p.m., with one car’s back end partially pushed over a guardrail. The crash involved a Dodge Caliber driving north that lost control due to slippery conditions near 750 West River Road and hit a Honda Accord traveling south, said Sgt. Jason Longley of the Waterville Police Department. The drivers of both vehicles and a passenger in the Accord were all taken to a hospital for injuries that were not life threatening. Longley said the department had a “fair amount” of calls related to the weather Monday, but no more than any other snowy day. It’s not unusual for Maine to get snowstorms in early April, according to Schroeter, the meteorologist. He said the bad weather is expected to continue through Tuesday, when another snowstorm is expected to move through the state. It will bring a chance of snow mixed with rain to the Augusta area during the day and accumulation of 1 to 3 inches of snow Tuesday night. In the western Maine mountains, including Franklin County and the Bigelow Range, up to 8 inches of snow was expected Monday afternoon and another 1 to 3 inches Monday night. The area is expected to see 1 to 3 inches during the day Tuesday and another 3 to 5 Tuesday night, Schroeter said. The storm will move out Wednesday. The temperature in the Augusta area is expected to return to the low 40s Wednesday and reach near 50 degrees Thursday.